We are the HVAC and air conditioning repair experts in Manchester, NH. If your AC unit is making strange sounds or not producing a lot of cold air, broken fan or leaking, call us today to schedule a repair. We service window units, central air, and commercial sized AC systems. At A+, we will provide a detailed inspection with top of the line diagnostic tools. 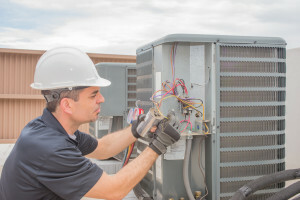 Our professional technicians will come in and assess your AC unit and determine what the best repair strategy will be. We can fix leaks, fans, filters, and broken parts to make sure your unit is in good repair and running as efficiently as possible. At A+ Plumbing, Heating & Cooling, we will even make recommendations as to how they may make air conditioning in more energy efficient. We service and repair all makes and models of AC units, including the ones we didn’t install. Be sure to fill out our contact form or call us at (603) 518-5777 today to schedule a repair of your air conditioning unit.